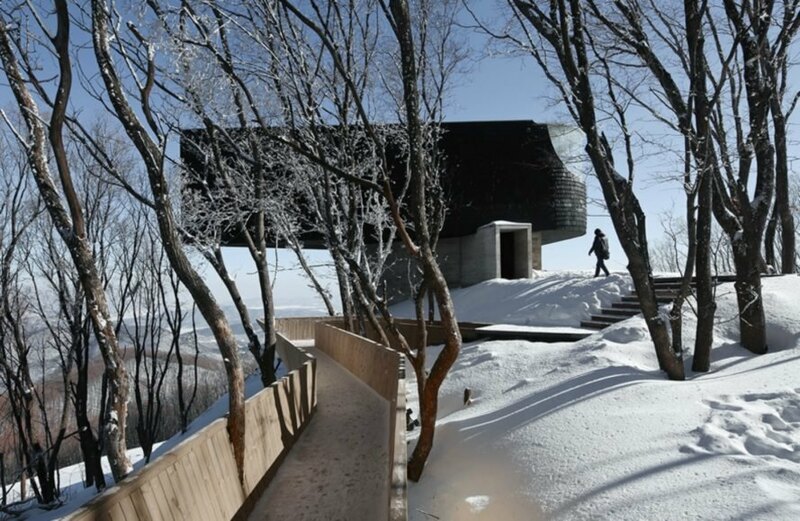 Beijing-based firm META-Project just unveiled a triangular cabin overlooking Songhua Lake in China’s northeastern Ji Lin province. 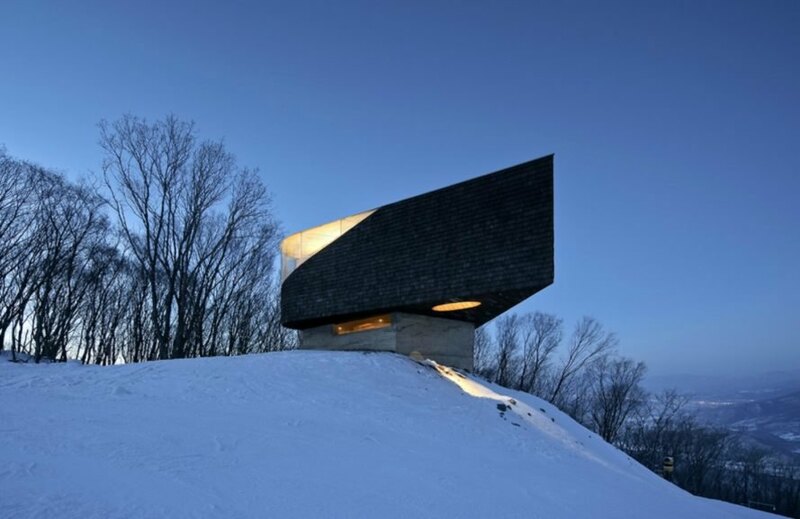 Located at the top of a steep ski slope, the Stage of Forest lookout – which is clad in Shou-Sugi-Ban wood – peers out over the amazing landscape, and provides a respite for skiers who need a break before swishing down the mountain. The building is located on the edge of a forested hillside overlooking the Songhua Lake Resort – a popular winter destination. 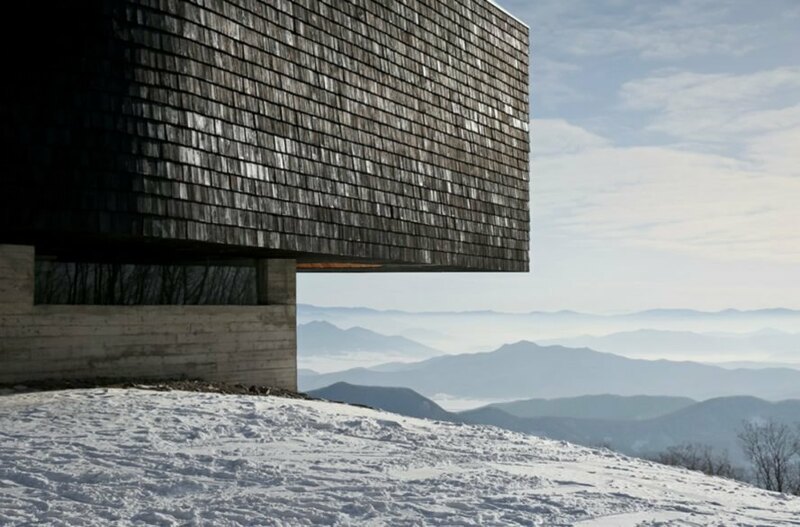 Jutting out over the landscape, the wood and concrete structure is a solemn presence against the snow-covered mountains in wintertime and it’s camouflaged by lush vegetation in the summer months. 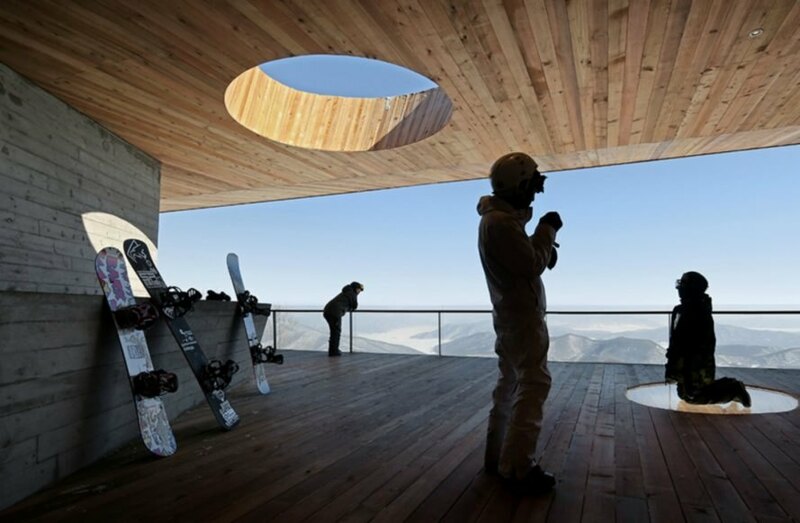 In addition to providing a place to rest on the slopes, the building will also be used year-round for exhibitions, conferences, workshops, and public and private events. The building’s “floating” design minimizes its footprint as much as possible. The compact concrete base occupies minimal square footage, while the larger volume provides a spacious interior to enjoy the stunning views. The building consists of a concrete shell topped with charred cedar shingles, which emit a silvery tone under the sunlight. From the first floor, visitors can climb to an open-air viewing platform clad in untreated red cedar. Oval windows in the ceiling and the floor allow optimal sunlight to enter the structure, while providing a playful peak at what’s “underneath the stage,” as described by the architects. 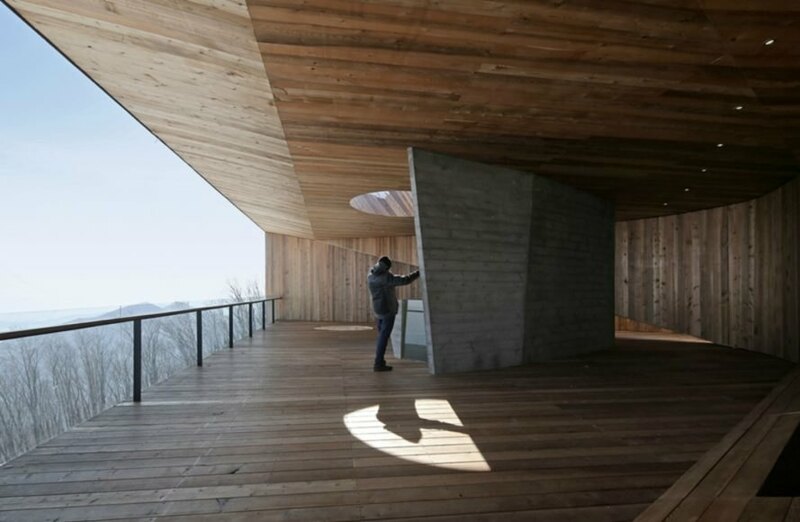 Beijing-based firm META-Project just unveiled a triangular cabin overlooking Songhua Lake in China's northeastern Ji Lin province. 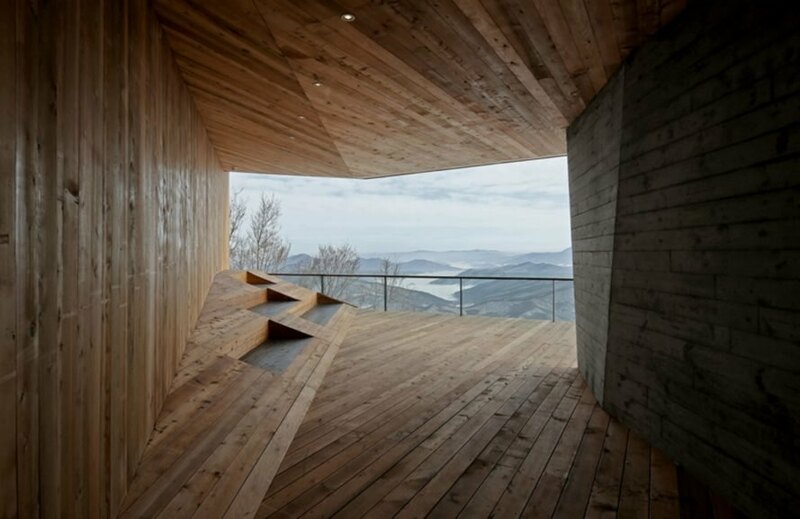 Located at the top of a steep ski slope, the Stage of Forest lookout - which is clad in Shou-Sugi-Ban wood - peers out over the amazing landscape, and provides a respite for skiers who need a break before swishing down the mountain. There is enough space to host private and public events. The building is supported by a concrete base. 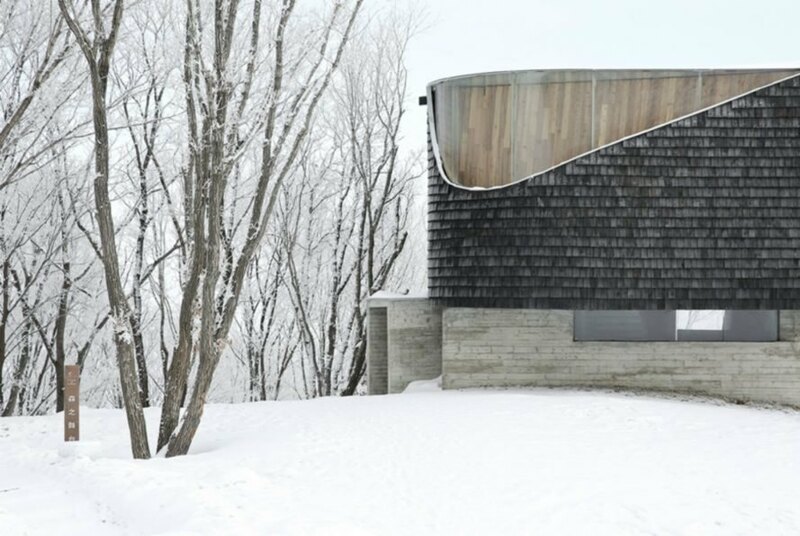 The dark shingles contrast the snowy landscape. Oval windows in the ceiling and the floor allow optimal sunlight to enter the structure. 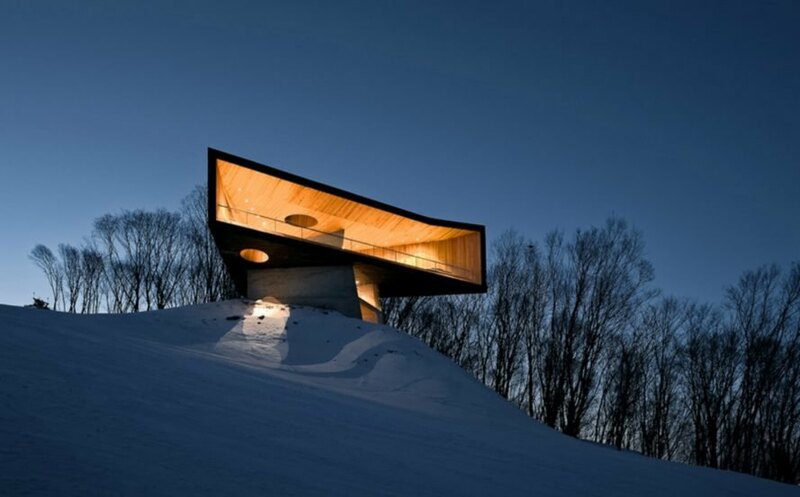 The rectangular form illuminates from the top of the mountains in the evening time. The compact concrete base occupies minimal square footage while allowing the larger, second volume to provide a spacious interior to enjoy the stunning views. Visitors can take in the stunning landscape views from the open air platform. The lookout pavilion is located on the edge of the forest hillside, overlooking the Songhua Lake Resort - a popular winter destination. The oval skylight lets in tons of natural light. In wintertime, the building is surrounded by snow, but camouflaged by lush vegetation in the summer months. Oval cutouts in the floor let people peer on those entering the structure. 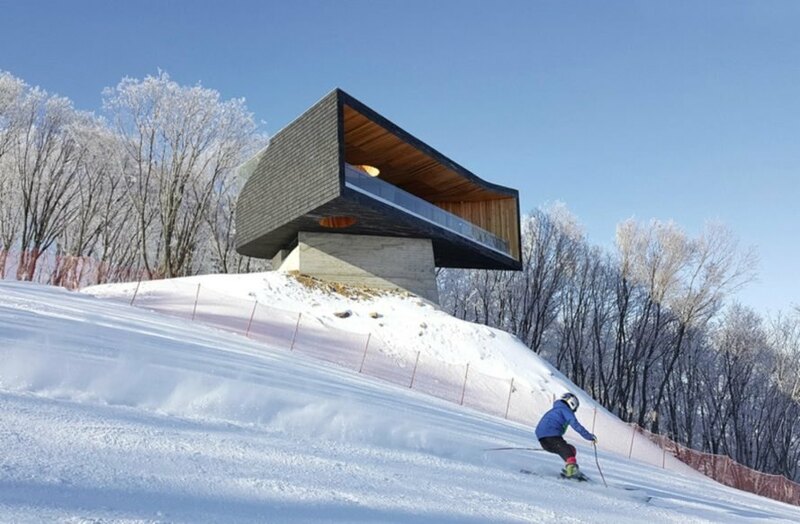 Along with providing a place to rest while between slopes, the building will also be used year-round for where exhibitions, conferences, workshops, and public and private events. The architects designed the floating design to minimize its footprint on the landscape as much as possible. 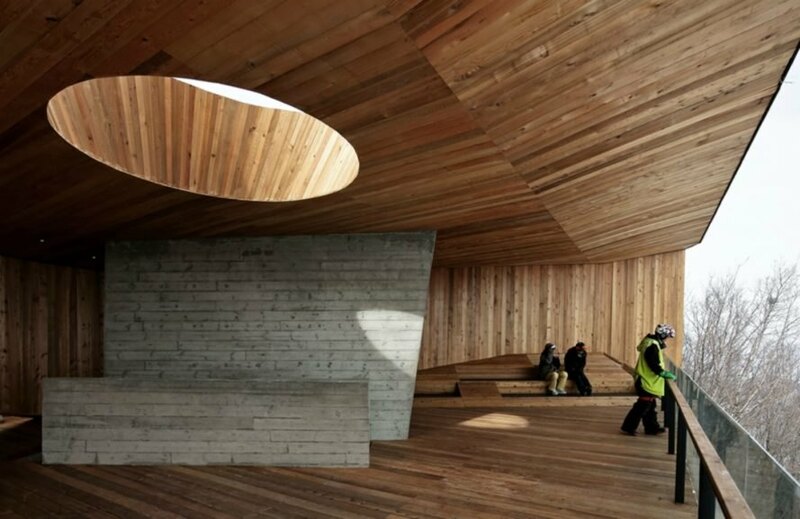 Topped with charred cedar shingles, which emit a silvery tone under the sunlight, the interior of the pavilion is a made out of a concrete shell. 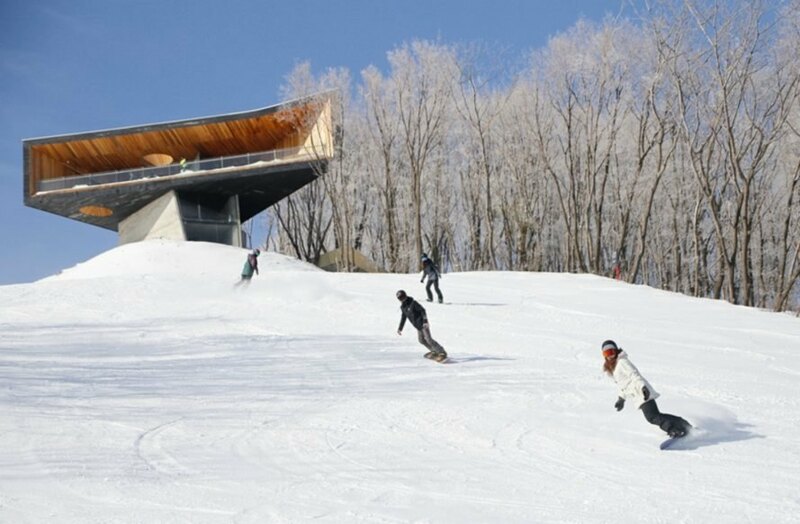 The Stage of Forest is a ski pavilion at the top of the mountain. The dark building is contrasted by the landscape in winter, but hidden by lush vegetation in the summer months. From the first floor, visitors can climb up to the open-air viewing platform, which was clad in untreated red cedar to add a bit of warmth to the design. Visitors climb up the concrete base to reach the platform. The concrete stairwell leads up to the wooden platform. META-Project designed the building to cause minimal impact on the environment.